Hello Dealsnloot Readers, I Am Here With New Free Recharge App Called YePaisa App.Now You Can Earn Upto 500 Rs From YePaisa App. YePaisa Is Only One Rewarding App Which Gives You Free Recharge Coupons & Free Shopping Coupons. Just Download YePaisa App From Play Store And Start Earning. 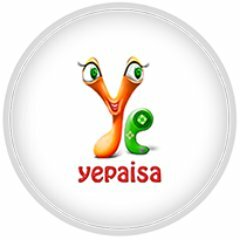 YePaisa app is giving free recharge,Oyo rooms voucher,Ebay voucher,dominos voucher and many more. Earn upto Rs.500. Refer and earn upto Rs.50. So Hurry !!! Grab This Loot Offer And Earn Recharge And Gift Cards. Now Click Sign up and Create Your Account with Your Details. Voila !!! You got 300 Yeps just by Sign Up. Now Start Referring Your Friends. Complete simple tasks and earn free mobile recharge and cash coupons of worth Rs 500 daily ! -Make easy money, earn free cash rewards daily! -Free eBay Coupons and vouchers. -Free Oyo Rooms discount vouchers. -Free Book My Show discount vouchers. Copy your link and share with your friends and family. As they download and join from your link. You will Earn up to Rs 50.